In a photograph taken of Chapman at Villers-Bretonneux in 1919, we see the artist seated amid the ruins of the church depicted in this painting. 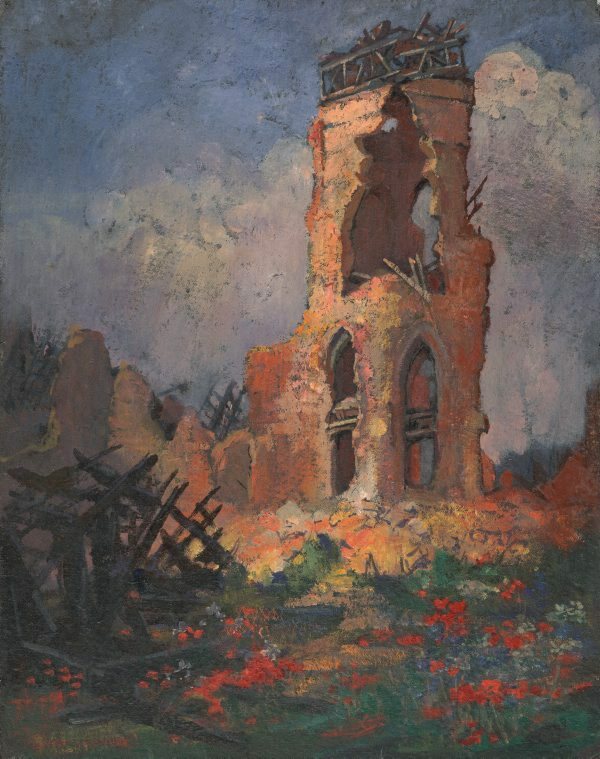 Despite the desolation of the landscape, the artist imbues a sense of optimism into the work, with its sunlit vista dotted with brilliant red poppies, thereby evoking hope, regeneration and life in a post-war world. Anne Gérard-Austin, Look , 'Remembering Evelyn Chapman: a new and unexpected bequest', pg. 14-15, Sydney, Apr 2015, front cover (colour illus. ), 5 (colour illus. ), 15.